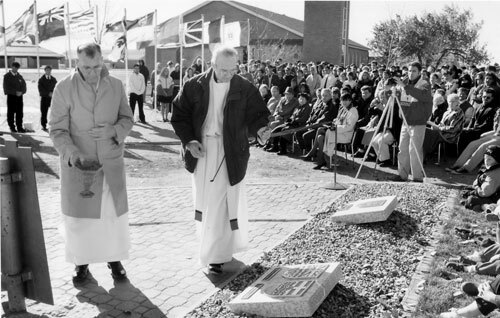 Father Norman Fitzpatrick blesses the coats of arms of the provinces during dedication ceremonies of Canada Park at Athol Murray College of Notre Dame, October, 1993. The park symbolizes Notre Dame's support for Canadian unity and honours the spirit of “Pere” Athol Murray. Notre Dame College of Wilcox, Saskatchewan was and is inseparable from the name of its founder, Father (Père) Athol Murray. James Athol Murray was born in Toronto in 1892; his father was a prominent industrialist and a founder of the Canadian Chamber of Commerce; his Roman Catholic mother died when Athol was four. He attended private French Canadian Catholic schools in Montreal, Toronto, and Quebec City. After graduation he began to study Law. He ended his studies, however, and quit his newspaper job to enter Toronto’s St. Augustine’s seminary. He was ordained to the priesthood in 1918, and came west to Regina in 1922. In addition to his duties as chancellor of the archdiocese, he formed a sports club made up of a group of Protestant boys who had been caught stealing candy from a church basement. Murray convinced his colleagues to drop criminal charges in return for the youngsters joining a sports club under his supervision. This became known as the Regina Argos Club and helped many boys find direction in their lives. In 1927, Père Murray was assigned to the village of Wilcox, south of Regina, and took many of his young Argos with him. He began to school them, first in the existing Notre Dame collegiate, founded by the Sisters of Charity of St. Louis in 1920, then in abandoned buildings acquired during the Great Depression. Murray officially established Notre Dame in 1933 as a classical college affiliated with the University of Ottawa. Students came from nearby farms and from across North America—many without the ability to pay tuition. Murray’s only admission requirement was a willingness to learn or to compete on one of his teams. The Notre Dame Hounds became well known in the west, winning many provincial titles in Hockey, football and Baseball, and traveling throughout North America to compete. The college became known nationally and began to send many young hockey players to the top junior leagues and the NHL. Père Murray consorted with Canadian politicians, and corresponded with Winston Churchill, Theodore Roosevelt and other contemporary leaders. He received the Order of Canada in 1968 and was inducted into both the Canadian Sports Hall of Fame and the Hockey Hall of Fame. He died in 1975, and in 1981 the name of the college was officially changed to “Athol Murray College of Notre Dame.” Over the years the college has developed into an institution which combines academics, athletics, and spiritual growth. Its motto, chosen by Athol Murray, is Luctor et emergo, “I struggle and come through.” The College has been associated with the University of Regina since 1976; in addition to its co-educational high school programs offered to day and residential students who increasingly come from around the world, it delivers a number of courses for university credit and is a site for off-campus credit classes.